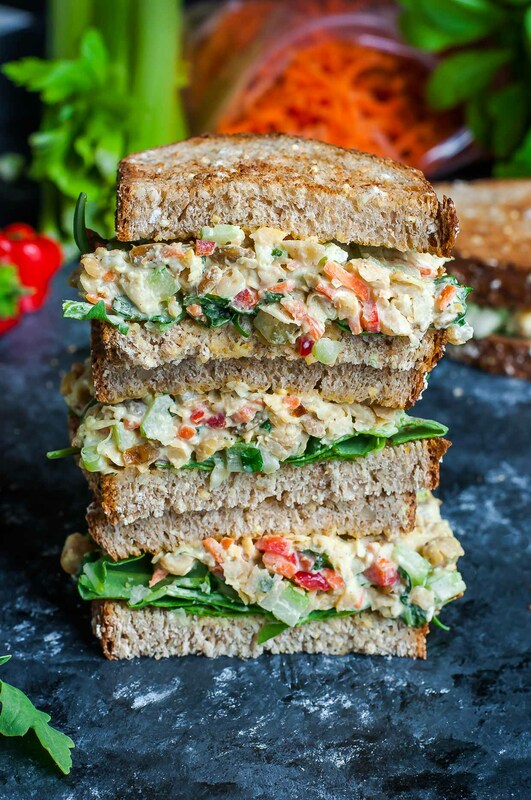 This tasty Garden Veggie Chickpea Salad Sandwich is a plant-based powerhouse of a lunch! Make it in advance for a party or picnic or to take along as an easy weekday lunch for work or school. Paul just informed me that I’m a millennial and it straight up ruined my day. HOW DID I NOT KNOW THIS?! I mean sure I don’t answer my phone when it rings. I obviously Instagram my food every dang day. And of COURSE I don’t have cable, surviving entirely off Netflix, YouTube, Amazon Prime Video for all my entertainment needs. My laundry detergent is plant-based, my back yard is teeming with home-grown veggies, and after working out I trade my sweaty yoga pants for a clean but identical pair, because stretchy pants are LIFE, people! LIFE! I guess I have no choice but to wave the white flag on this argument. I’m a millennial. The kind of millennial who makes tuna salad out of smashed chickpeas and veggies and offers no apologies because IT’S DELICIOUS, YO! I’m hopelessly obsessed with this chickpea salad. There. I said it. It’s so fresh and full of flavor that it puts every tuna or chicken salad I’ve ever had to shame. Seriously!!! I have no problem eating it straight out of the bowl, though it’s also stellar in sandwich form, and atop a bed of leafy greens and veggies. Hellooooo versatility! The first round of photos I took of this recipe failed to justify just how scrumptious this dish is so I had to reshoot the following week. Was this self-sabotage in an attempt to enjoy yet another round of chickpea deliciousness? Maybe. Another fun fact about this recipe? Everyone can enjoy it! Ok fine, everyone except my primal paleo peeps who don’t do legumes. Man they’re missing out right now! This crunchy chickpea salad is vegetarian with an easy peasy swap to make it vegan. It’s also dairy-free and gluten-free and packed to the brim with all things veggie. Whether you raid your garden, your local farmer’s market, or even the grocery store produce aisle, this salad is sure to rock your plate and veg up your eats! Drain and rinse your chickpeas and add them to a large bowl. Mash with a potato masher until texture appears flaked, almost like tuna salad. I use both a potato masher and follow up with a fork to make sure every chickpea is deliciously smashed. You could also use a food processor and skip the arm workout! Chop your green onion, celery, shredded carrots, pepper, and pickles. Add to the bowl with your chickpeas, then add mayo, dijon, yellow mustard, dill, salt, and pepper. Stir well to coat. Fold in sunflower seeds and basil (as much or as little as you'd like) and adjust any ingredients to taste. Pile high on bread with all your sandwich fixings or enjoy as a wrap, with crackers, on a salad, or simply dive into the bowl spoon-first - anything goes! This makes a FABULOUS make-ahead dish for lunches during the week and is great on the go too. Pack a sandwich or salad for lunch/school or make it ahead to serve at a party or picnic. The salad will be great for approx. 4 days in the refrigerator so make it for now, or for later! Vegansaurus Chefs: Use your favorite vegan mayo and you’re good to go! T-rex Chefs: Pretty please promise me you’ll try this?! Put down the bacon and pencil in some plant based lovin’ for lunch today! Gluten-Free Chefs: Serve this crunchy chickpea salad in lettuce wraps, salad-style on a bed of greens, or on your favorite GF bread. I’m no stranger to eating this stuff straight out of the bowl with a spoon – so good! 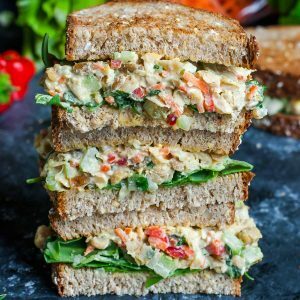 Seriously LOVING this healthy Garden Veggie Chickpea Salad Sandwich — I can’t wait for you guys to try it! Either way this was delicious and so easy to make! Thank you! SO good! 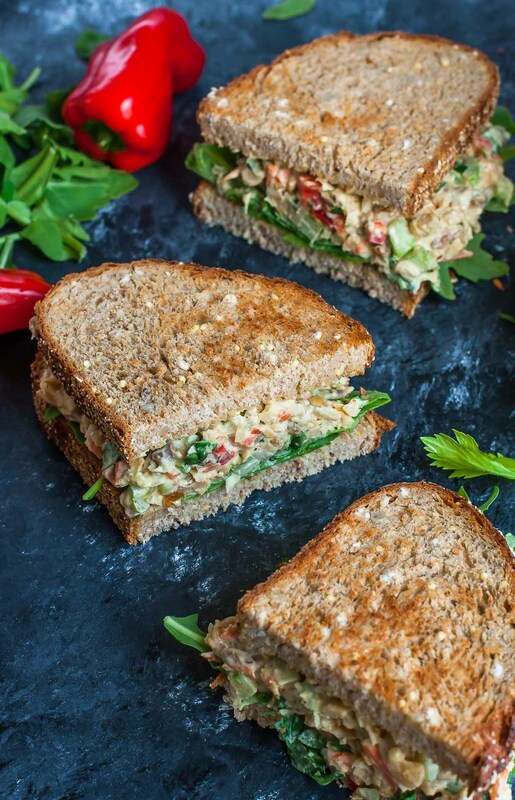 Never would have thought to make chickpea salad sandwiches before but this was so yummy! Thanks so much! This is one of my favorite go-to recipes! I make a double batch on Sundays and enjoy it for lunch through the week. Thanks so much! I had fresh dill but no basil on hand so i just added a lot of fresh dill, and more sunflower seeds (probably 1/4c) cuz i am OBSESSED with their salty crunch. Love this scooped onto cucumber slices and bell pepper chunks as well as ontop of some arugula spinach salad. Sorry you’re a millenial ;)) I’m just barely too old to qualify! Haha, somehow I’m good with that. HUZZAHH! So stoked you enjoyed the chickpea salad! Haha and you will never ever ever hear me utter YOLO but is it okay if I ironically use hashtag a la that hilarious Justin Timberlake hashtag video? Tell me you know the one! So glad I found this recipe, it’s so easy and yummy. I have a food diary on my blog with what I’ve been eating for our 2 week clean eating challenge, and I’ve had this probably 3 times already! Ahhhh yay!!!! Thank you Megan! Stoked that it even won over the T-Rex peeps! Thank you Colleen! Just made this for lunch. Didn’t have pickles so subbed capers. Super delicious, hearty and satisfying. Capers sound like a awesome addition to the chickpea salad! Thanks Laury! Omg!! This is so delicious!! Thank you for this recipe! Freaking over the added jalapeño – SOUNDS AMAZING! Thanks Amanda! This was delicious. I’m passing this on to my friends. Perfect with a toasted whole grain quality bread. Thank you so much Stephanie! I made this today, I added cilantro instead of basil because I did not have any on hand. This is seriously delicious! I read all the reviews and they are all correct! Excellent recipe! Thank you for sharing this, my son is a new to being vegitarian and I saw this recipe and homerun, he loves it! I just made this chickpea salad this morning and have it in the fridge for lunch! It was so easy to put together and is so colorful! I can’t wait till lunch to try it! Such a fun recipe, you can make it with whatever you want. Thank you for this one!!! Wow! This is soooooo delicious! It will def be a regular in my house! Even my 13 year old like it! Do you completely mash the beans or leave them a little chunky? I. Cannot. Wait. To. Try. This. Thank you for you passion, thank you for sharing. This is an absolutely stellar recipe! Even my young kids enjoyed eating this! I think I may buy pita bread to stuff this into next time so It doesn’t fall out! Thank you, this will be in my regular rotation! Thank you for the garden veggie mix for a sandwich plus.Absolutely delicious! I only had half the ingredients to make this and it still tasted amazing!!!! My new go-to for sure!!!! This was SO DELICIOUS. My only complaint is that the salad mixture kept squeezing out the side of my sandwich, so I couldn’t eat it as fast as I wanted. I’m already thinking about how soon I can eat the leftovers for lunch tomorrow. . .
LOL! As a speed-eater I totally feel you! 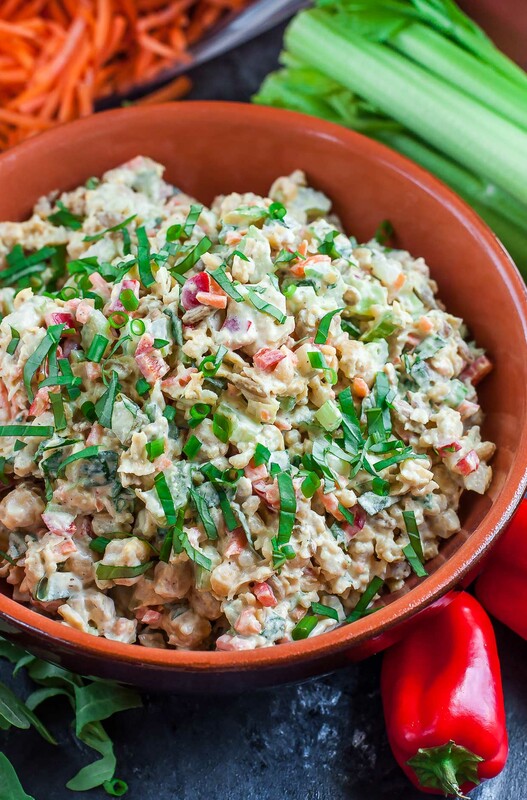 So stoked you loved this chickpea salad as much as I do!! I make it once a week and the leftovers rock! This is delicious! I’ve been a vegetarian for 22 yrs- finally found something that fills that “need” for tuna salad. AMAZING! Oh my goodness!!!! I just made this and it is to die for!!! I love, love, love this recipe!! Thank you so much for sharing it with us, it is definitely a keeper ? Thank you Dominique! So stoked you enjoyed it! So, so good. I got this recipe from a vegan friend, but it’s perfect for our kosher-keeping household. I’m always looking for parve (dairy-free, meat free) recipes to add to my arsenal and this one is such a keeper. I made it with vegan mayo so that said vegan friend could also eat it and it was amazing! I followed the recipe exactly as written, except I didn’t have any fresh basil so without the basil. Ahhhh yay! So so glad to hear it! Thank you Karen! Thank you Georgie – hope you adore the sandwiches! I made this for my church potluck whic h consist of several vegetarians, people with dietary limitations and just picky eaters. It was a huge hit and I have been asked to bring it next month. I am thinking you made me queen of the potluck!!!! Thanks. I very recently became vegan, and I’ve been craving a sandwich! This hit the spot! I’ll definitely be making this again, and it’s a great spread to take to potlucks as well! I actually made this with chickpeas that I cooked myself rather than from a can, and it was just SO delicious and creamy. This is delicious!! It has become a regular part of my weekly meal prep. Very tasty and so easy to make! Amazing and so versatile. I loved this. I never comment on things like this but this was so good I felt like I had to! This was really amazing and my carnivore of a fiance LOVED it! Subbed 1 whole avocado in place of the mayo and it was delicious! I’m so honored you stopped back over to let me know what you thought! Thank you Ashleigh! 🙂 Super stoked it was a hit and love the avocado for creaminess! I tried this because it looked good in the photo. I didn’t expect it to be so delicious! I have tried other “healthy” recipes and many times I’ve only made them once. I’ll be eating this one often!! I absolutely love this! 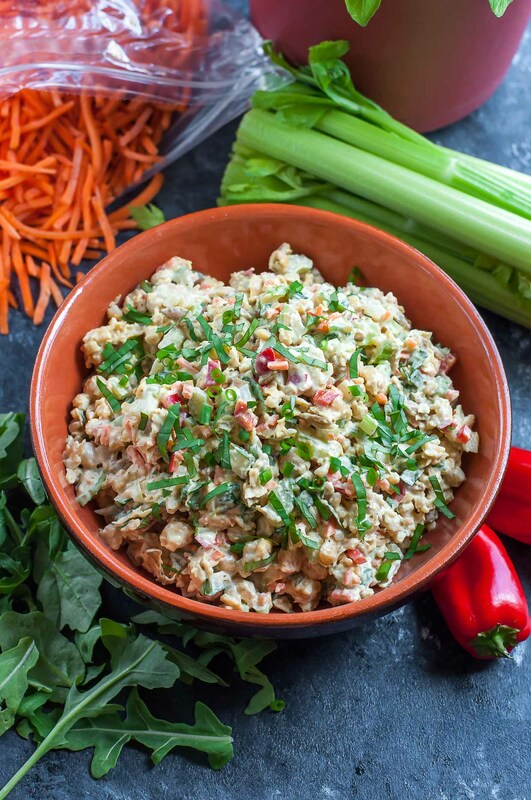 I rarely comment on a recipe, but I just couldn’t not let you know how amazing I found this chickpea salad…. thanks!!! Excellent, even without any bread. Added Oasis brand roasted red pepper hummus. A favorite! So happy you enjoyed it Frances! Love the addition of red pepper hummus! LOVE this! Very easy to make and could be adapted to fit a variety of tastes. Always a huge fan of something I can make ahead. 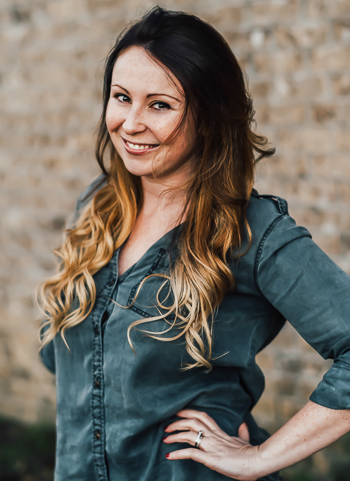 Hi, Jenn! The pic with your recipe had me stop and look into the ingredients. Didn’t have the sunflower seeds or basil on hand, but I’m glad that didn’t stop me from making this! I really couldn’t figure out what the taste was going to be like, as I don’t add veg to tuna or egg salad, but the reviews were enough for me to give it a go. Just had some in lettuce wraps. Delicious! I have girlfriends who I know will love this, too, so I’ll be passing it along, Thanks! ? Jenn, my dh tried a spoonful and he really likes it! Said it’s reminiscent of both potato salad and egg salad. 2 thumbs up! This was so delicious. The flavors blend so well and it was great in a wrap! This is perfect! I love chicken salad, but don’t care about the chicken part. And I usually have chick peas in the pantry. Whipped this up for lunch the other day and it totally hit the spot. Thanks! I didn’t notice the nutritional breakdown for this recipe. Is it available? Hi Anne! I don’t typically include them because so many readers use different ingredients/mix-ins/swaps for the recipes and I don’t want to mislead anyone. The best way to get a nutrition breakdown is to use your favorite calculator and enter what you’d like to use. I’m loving myfitnesspal.com and it’s free! Thank you so much for sharing. This sandwich is truly amazing . It will be my go to lunch. Awesome recipe ! So happy you enjoyed it Ashli and that it will be your go-to lunch – thank you so much! Thank you for your recipe, I changed it with the ingredients that I had on hand. I added avocado ,Brussels sprouts ,and walnuts.I did not add any mustard, but added Grey salt. The pickles,carrots and scallions really added to the flavor. I liked the combination of mashed garbanzo beans with vegtables. Very versatile recipe. Can yoU replace the vegan mayonnaise with anything? We are on a p plant-based diet but we use a lot of vegan recipes. Wondering if quacamole would be a good sub for mayo???? I can my own chick peas and have 27 jars awaiting…guess what I’m making tonight?! YUM! This looks heavenly, thanks for sharing! This was FABULOUS!!!! This was the first time I have ever tried chickpeas and was thoroughly impressed! I don’t like dill pickles, so I used pickle relish instead and it came out great! So in love with this recipe and I will be making it again and again! This is the first vegan recipe I made on my first day in my vegan lifestyle. This was amazing! Thank you so much for this…it will be a regular in the rotation! Easy, flavorful and super filling. I made a whole sandwich and probably could’ve done with half and a small cup of soup! Thanks again! I love this recipe as well as the basil tomato version. Everyone who has tried it loves it. It is super easy to double and triple recipes for a potluck. I eat with a bed a greens- dandelion greens add a wonderful bitter taste to the overall blend. This makes a fabulous salad sandwich! I didn’t have any dill pickles or dried dill, so I used a 1/4 cup of sweet relish. I toasted some whole wheat bread and put a little mayo on the toast, added some romaine lettuce leaves and piled on the chickpea salad. Heavenly! I can’t wait until tomorrow’s lunch… and dinner! Made this today and it is my new favorite salad! Used red onion and fresh dill. Will make this again and again! Thanks for the delicious recipe. Yay!!! Thank you Lisa — so super stoked to hear it! Hi Beverly! The fresh veggies in this salad wouldn’t freeze well unfortunately. Love your recipes—- would REALLY love to see nutritional info! Am I missing something? Made a giant bowl of your chickpea salad. It’s super yummy!! Substituted the mayo for Greek yogurt and added an avocado, bc I needed to use it. Thanks for the recipes! Do you have a suggestion for a dill pickle substitute? I love them but those aren’t available in my country. We have sweet pickles but I don’t like those and that doesn’t seem like a good sub anyway. Hey Zoe! I’m not a fan of sweet pickles either. You can actually skip the chopped pickle entirely and the recipe will still be stellar! I make it both ways depending on what I have available and love it with and without. 5 stars! It is a keeper. Excellent taste. I just put mine on top of a piece of toasted pita bread. Highly recommend this. Thank you for posting this! 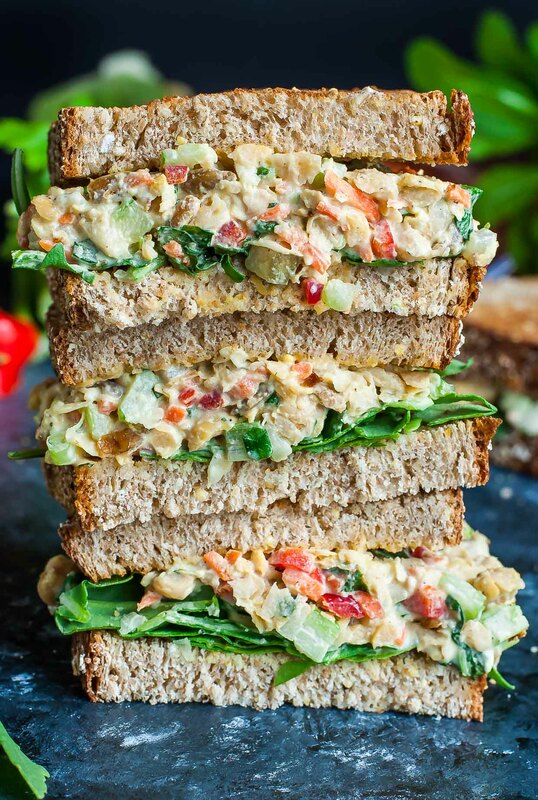 We just started making a chickpea salad at the bakery where I work and it is AWESOME, but this one looks amazing. I’m going to have to give it a try! I just made this veggie chickpea salad using onion flakes since I was out of green onions. This is delicious! Thank you for sharing the recipe. I had a can of chickpeas in my pantry staring me down. If it was animated it would ask me, “Are you ever going to make something out of me?” Lol. Why yes chickpeas, you are now a yummy veggie salad sandwich. Thanks again, I’ll be making this often. I’m not a millennial so maybe that’s why I never thought of doing this! Sounds fabulous! Uhhhh don’t mind me, I’ll just be over here drooling on my keyboard. YUM!!!! This looks so good, Jenn! Girrrrrrl you need this sandwich! Thanks love!